The great physicist, Albert Einstein, had once famously remarked that the fourth world war would be fought with stones, but honchos in finance market say the next battle will be ‘virtually plastic’. J&K, however, joined this battle quite late because it was preoccupied with literal gun-battles. The first technology intervention that took place in J&K was the entry of a stand-alone Automated Teller machine (ATM) in 1998. Now even J&K Bank, the big daddy of banking in Kashmir has nearly 3.2 million ‘card holders’. By the end of May 2015, J&K was being served by around 2210 ATMs. By conservative estimates nearly forty percent of the cash dispensed by banks is through ATM cards alone and the trend is quite trendy. J&K Bank alone dispenses Rs 20,000 crore cash through its ATM network annually! With the cards, services and retail outlets linked by internet to data backbones of the financial institutions, J&K is unable to stay embraced with the traditional paper-banking and routine business. Pureweave is Kashmir’s only company that manufactures apparels and sells them only virtually. Kashmir Box, is another on-line multi-product retailer from J&K. Most of the hotel bookings are taking place virtually for at least two years now. Even State Bank of India has most of its client base carrying ATM cards. But in case of credit cards, the bank is issuing it against fixed deposits to ensure the return of money. In Kashmir, it has around 200 PoS (Point of Sale) machines deployed in the market, many more in Jammu. But SBI and PNB which are significant players in the banking industry fall next to J&K Bank and HDFC bank which are key players in the plastic money management in J&K. In fact the two are gradually facing the heat from other second generation banks which are using their strong IT-platform to get the pie of the cake in the new ‘emerging’ market. J&K Bank has been part of J&K’s evolution from a princely state to a state and was a traditional bank. It pioneered investments in technology and is lead the banking sector. “In the last quarter, the cash dispensed through our ATM network was Rs 5063 crore and it involved 1.14 crore transactions,” informed sources in the bank said. “It is only growing.” The bank has slightly more than 32 lakh ATM card holders. Bank tops in the ATM network list with more than 900 kiosks and insiders say it will cross the four-digit number soon. Besides, it has 46344 credit cards issued across J&K and has nearly 5000 PoS machines deployed in the state. “We have gone aggressive and right now exist almost everywhere,” one executive informed. Aggressiveness in J&K Bank is considered a bit reactionary. HDFC Bank that is gradually expanding into urban and sub-urban space in the state is using its strong IT platform to stay relevant to the tech-savvy new generation. J&K has slightly more than one-third of its population connected through cell phone which is coming handy to all banks including HDFC bank. Bank executives at HDFC said that they have 201 ATMs which record daily cash dispensation of Rs 16 crore. All its more than two lakh clients carry ATM cards. 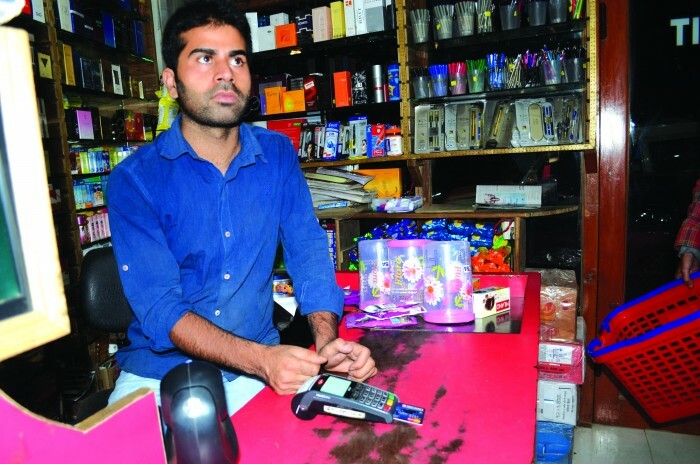 “We have 35000 credit cards and in J&K market we have 2000 PoS machines,” the executive said. While everybody is aware that banks are making lot of savings by reducing their costs with customers taking cash from machines, what is the quantum of money that goes in retail using credit cards? On-line shopping is the new fad that was choked by the September 2014 floods as some of the online retailers stopped serving most of Kashmir. Certain companies which had warehouse facilities in Srinagar and Jammu stopped servicing certain addresses for not paying at the time of delivery. But the on-line shopping with the pathetic bandwidth in J&K is still in vogue and picking up fast. Open source market information suggests that J&K Bank alone records nearly 3000 transactions on its PoS machines across the state involving around nine million rupees a day. “In the last quarter, it has not been more than Rs 75 crore,” said one of its PoS competitors who always have lot of information in his kitty. HDFC insiders, however, claim they are ahead. “In a month, we record 1,75,000 transactions on our PoS machines involving an amount of Rs 42.70 crore,” one executive said. But what about credit cards? In J&K bank, market sources said credit cards usually have an outstanding of Rs 60 crore when the billing cycle starts. In HDFC Bank the net outstanding on cards is Rs 80 crore. In addition to these two, there are many others players. All this indicates that e-commerce in J&K is about to cross a Rs 1000 crore story soon.